Uh oh. 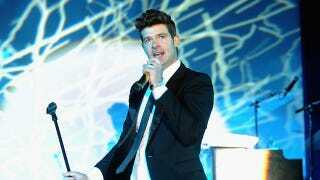 Robin Thicke has gotten himself into a little trouble with the law. The Grammy winner was arrested in New York earlier today for possession of marijuana, after the cops happened upon him smoking a joint in a car. Apparently, he and another person were hanging out and indulging in a Cadillac Escalade that was parked near Third Avenue and East 21st Street. Dude, bro, getting arrested in Gramercy Park is so lame. My husband just thought I was so dorky. He was like, "Why are you so excited?" I must of tried on like six outfits. I'm meeting a princess! You don't understand. You have to be wearing the right outfit and the whole thing.